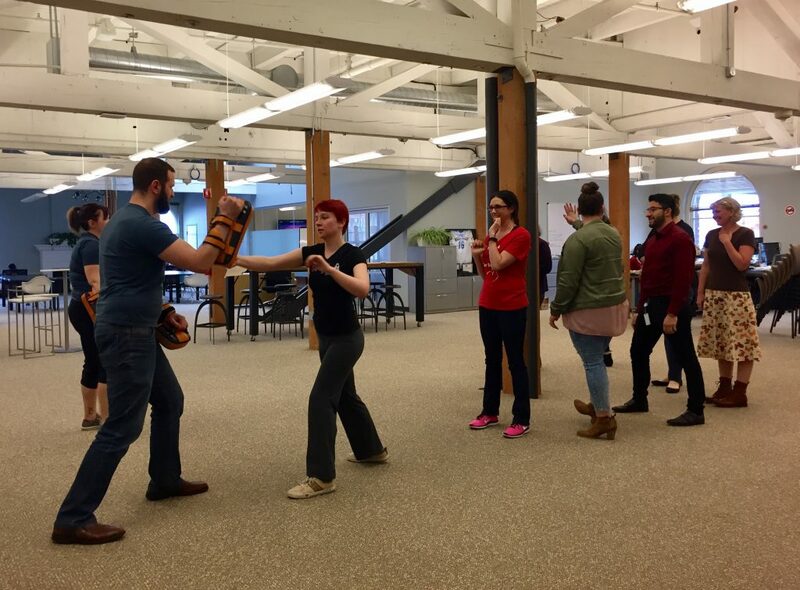 RealSelf employees practice their self-defense techniques. This week we turned part of our office into a temporary dojo when we launched our new learning series with a self-defense class. 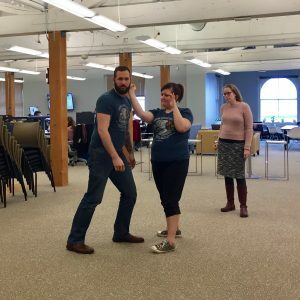 Rachel and Jordan from Fighting Chance Seattle joined RealSelf for an afternoon to teach us about empowerment, awareness, and, ultimately, confidence. “I believe in teaching you skills not only for an extreme situation but skills you can practice and build in your day-to-day experiences. Practice your firm ‘no’ with a telemarketer. Seriously! The more you practice, the easier it will be to clearly and directly say no when your intuition says you need to,” explained Jordan. Fighting Chance Seattle demonstrates for RealSelf. “Hearing out loud ‘Whatever your intuition is telling you: you’re right.’ was super cool!” said Kimberly Lund, RealSelf Office Manager. Eventually, Jordan and Rachel moved to some training, both demoing some moves and letting us get some hands-on-pads practice. The bottom line? “Put something hard somewhere soft,” Jordan said as he pointed to his elbow and the base of his palm. Special thanks to Fighting Chance Seattle for sharing their knowledge and expertise in an approachable, welcoming, and totally-not-scary format. For those interested in more, the Ballard dojo features a variety of martial arts classes and monthly self-defense workshops with a focus on empowerment and awareness. The RealSelf Learning series will feature a different class, talk, or event every month that supports learning focused on personal and professional development to make us more confident in our daily lives. Want to join our next class? We’re hiring!